For the gospel of God to remain in focus it needs a frame. That is to say, if we are going to proclaim Christ clearly and consistently, we must understand the biblical presuppositions necessary to preserve and protect the gospel. In particular, the gospel needs at least four truths to guard it from distortion. These truths do not add anything to the gospel, but they do ensure that nothing is taken away from the gospel. What are these ‘framing’ truths? From 1 Corinthians 15, I believe Paul explains the gospel as needing to be kept (1) central, (2), external, (3) Scriptural, and (4) historical. Without these four frames the gospel will be put in jeopardy. Therefore, to better understand the biblical presuppositions with undergird the gospel, let’s consider each of these truths briefly and then what happens when they are lost. 1. The gospel must be central. First Corinthians 15: 3 says, “For I delivered to you as of first importance what I also received.” The word “first importance” indicates the priority Paul put on the gospel. More than anything else in his ministry or preaching, the gospel received first place. And so it should be with any faithful Christian or healthy church. 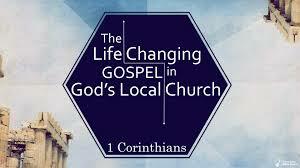 The gospel is what saves us, sets us apart, unites us to Christ, and makes us a people pleasing to God. As a church, the gospel must define who we are, must shape the emphasizes of our ministry, and fill the content of every conversation. And why? Because the gospel is not a one-time, ticket-punch out of hell. It is the good news about Jesus Christ that gets better every time you hear it. It is the bedrock, centerpiece, and power-plant for everything in the Christian life, and thus it must be central. 2. The gospel must be external. More specifically, the gospel must come from outside ourselves. Again in 1 Corinthians 15:3, Paul says he delivered to the Corinthians what he himself received. This is tradition language, meaning Paul has passed on to the Corinthians what he himself has received. Only in this case, the gospel is not a man-made tradition like Easter Eggs and Sunrise Services. The gospel is a revelation given by God himself (cf. Matthew 16:13ff.). As Paul says in Galatians 1:16–17, he did not consult with anyone when he received a revelation of the gospel from Jesus Christ. His point is to assure us that his gospel is from God, not from man. For Paul (and all of us) this God-given gospel comes from outside ourselves as a message of salvation meant to confront us in our sin and offer a way of escape in Christ. This, any message that says “Believe in yourself,” or encourages someone to activate some power from within is not the gospel. In fact, any preacher that invites people you to release your inner potential or trust in your heart’s desire is preaching a false gospel that will lead you to hell. Beware! The true gospel comes from outside yourself. 3. The gospel must be Scriptural. In 1 Corinthians 15:3–4, Paul says Christ died and rose again in accordance with the Scriptures. By citing the Hebrew Bible, Paul is explaining how Christ’s death for sin and resurrection on the third day are explained by the inspired words of God. In particular, Paul is not quoting one passage but with the plural “Scriptures,” he indicates the way in which multiple Old Testament promises are now fulfilled in Jesus substitutionary death and triumphant resurrection. The gospel, therefore, is not something that begins with Jesus. It began in the beginning and continued throughout the Hebrew Bible, as God prepared the way for his promised Son. Indeed, any understanding of Jesus apart from this Old Testament revelation will go astray, because Jesus is the Christ of Israel and the Hebrew Scriptures. Therefore, we must proclaim the gospel which stands in continuity and fulfillment of these OT promises (cf. Romans 1:1–7). 4. The gospel must be historical. The gospel is not an ethical list of rules, but an historical reality rooted in God’s work in space and time. This fact is confirmed by the historical presentation of the whole Bible, but also in the way Paul speaks of Jesus Christ and the witnesses who beheld his death and resurrection. The gospel, therefore, isn’t a mystical experience hidden away in some middle eastern cave; it is an historical fact attested by dozens and hundreds of witnesses. Christ was crucified in public, buried in a known location, raised on the third day, and publicly recognized to his followers for 40 days. All in all, the gospel must be maintained as historical if it is to supply any benefit to us today. At the same time, this historical gospel must also be kept central, external, and Scriptural. Any deviation from these four sides framing the gospel and the gospel will be distorted or lost. What Happens If These Frames Are Lost? Just consider what might happen if any of these ‘sides’ are questioned or denied. First, if the gospel is not kept central, it will obscure, distort, or ignore the picture of Christ who is meant to stand at the center of the gospel. Whenever a church or an individual deviates from putting Christ at the center, they will of necessity distort God’s message of salvation. When the gospel becomes one fact among many about God, it’s power and its abiding presence are in great jeopardy. Christians must keep the gospel crystal clear, but that can only happen as they keep it central and are quick to spot smudges and slight variations of its original message. Second, if the gospel is made an internal experience or something that all people know by nature, then its message becomes absorbed into the sea of religious experiences. We are not born with an innate knowledge of Jesus Christ. Someone had to tell us about him. General knowledge of God is given through creation (Romans 1:18–20), but saving knowledge of God comes through the gospel alone. Hence, it must be introduced as alien concept to others who do not currently know the gospel. If the gospel becomes some general knowledge about God, it will deviate into a natural religion devoid of Christ. This might be more palatable to the world, but it is not what God commands. Third, if the gospel is not Scriptural, then the person of Jesus Christ becomes an idol fashioned in our own image. How many ways has Jesus’ name been used for false purposes? Sadly, there are too many too count. In truth, only the Biblical Jesus saves. What a horrible (and yet predictable) trick of the devil that the name of Jesus is often well-known, but not according the Scriptures. We must diligently proclaim the gospel of the Bible and not make apology for confronting others who have misshapen, non-biblical ideas about Jesus. In other words, we must remember that talking about Jesus is not the same thing as speaking the true gospel. May God give us grace and wisdom to speak with gentle boldness. Fourth and finally, if Christ’s resurrection is not an historical reality, then there is no salvation for us. This is the whole argument Paul tackles in 1 Corinthians 15, where he says if there is no resurrection of Christ, “then our preaching is in vain and your faith is in vain” (v. 14). This is no light matter, but thankfully there is ample evidence of Christ’s bodily resurrection—hundreds of witnesses beheld his resurrected body (15:7), the apostles saw, heard, and touched him (1 John 1:1–4), and many of these same apostles went to the grave testifying their risen Lord. Because men don’t die for a lie, we can stand assured in their testimony and the reality of Christ’s resurrection. In truth, the gospel stands or falls with these four framing truths. They are not the gospel in themselves or together, but they preserve and protect the gospel and thus they are necessary for us to see the full content of the gospel. And what is that gospel? Namely what Paul says it is in 1 Corinthians 15:3–8 . . .
That Jesus died for our sins in accordance with the Scriptures, that he was buried, that he was raised on the third day in accordance with the Scriptures, and that he appeared to Cephas, then to the twelve. Then he appeared to more than five hundred brothers at one time, most of whom are still alive, though some have fallen asleep. Then he appeared to James, then to all the apostles. Last of all, as to one untimely born, he appeared also to me. May we hold fast to this gospel for our own salvation and the salvation of our hearers.